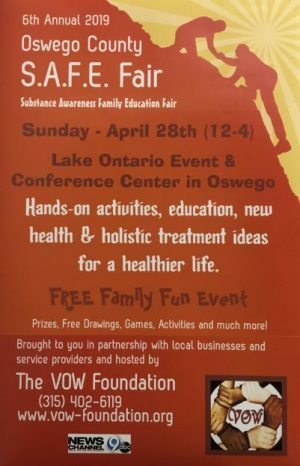 OSWEGO – The VOW Foundation will once again hold its annual Oswego County Substance Awareness Family Education Fair at the Lake Ontario Event and Conference Center on April 28 from noon – 4 p.m. in Oswego. This is a free family fun event. The opioid epidemic continues in Oswego County and education is vital to preventing further tragedies. The statistics remain alarming, however, treatment options are now much more available. This year’s event will focus on holistic and alternative ideas to help prevent and treat addiction and/or mental illness. The New Vision Health students will have ‘stations’ of hands-on activities around Mindfulness, in addition to the many service providers and organizations ready to provide games and activities around educating about synthetic drugs, current drug trends, addiction, prevention, treatment and healthy options. This event is made possible in cooperation and collaboration with many, many others. Sponsorship dollars received for this year’s event include the following: ARISE, Lydall Performance Materials, CR-ARC, Exelon Generation, Eastern Shore Associates, NBT Bank, Felix Schoeller NA, Caraccioli Law, Planned Results, Fulton Savings Bank, Farnham Family Services, General Laborers Local 633, Sorbello Farms, Universal Metal Works and Friends of Will Barclay. The VOW Foundation is named after Victor Orlando Woolson, who died in 2012 from a synthetic drug purchased over the counter in Oswego. The mission of the VOW Foundation is to educate and advocate about synthetic drugs, addiction and mental illness. Currently, street drugs are being found to contain synthetic drugs as a mixture of their makeup with former names, such as Molly, Ecstasy, Cocaine, Heroin, etc. These are not the same drugs of prior generations. In addition to hands-on activities, there will be Narcan training, speakers, games, raffles and refreshments. Full program details will be provided on the Event Page on Facebook. If you would like to donate a raffle basket or like further information, please contact Teresa Woolson at (315) 402-6119 or email at [email protected]foundation.org.